Snowbirds are people that flee Iowa for warmer weather farther south. By farther south, we usually mean Florida, Texas or Arizona. 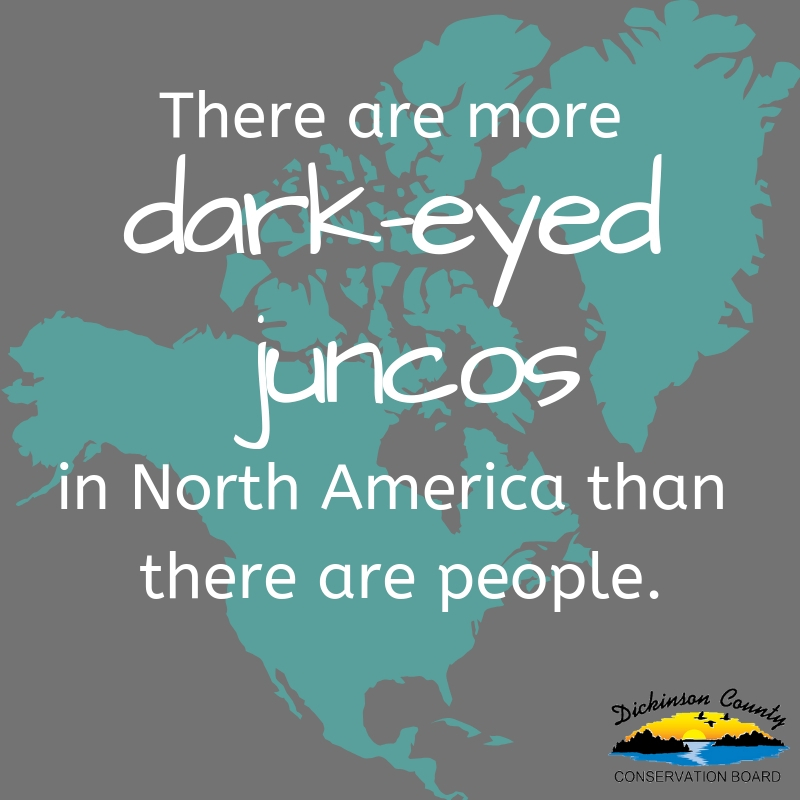 However, for some residents of the far north, like dark-eyed juncos, Iowa is the warm haven to which they flock. As winter sets in, these pretty little sparrows migrate from their breeding grounds in Canada and Alaska to places throughout the U.S.
Dark-eyed juncos outnumber people in North America. Dark-eyed juncos are one of the most common birds in North America, with recent estimates putting their population at about 630 million. That’s more than the population of North America, which is estimated at 579 million, and almost twice the population of the United States, which is at 325.7 million. 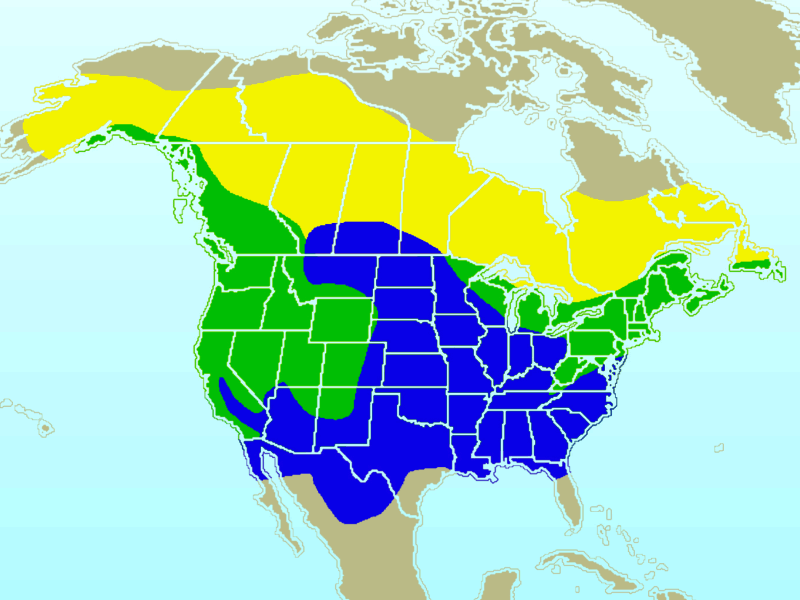 Juncos look different dependent on the region where they live. Iowa has slate-colored juncos that have a smooth gray back and light gray or white belly. 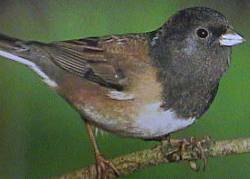 Oregon juncos, found throughout the west, have a dark hood, brown back and rufous sides. 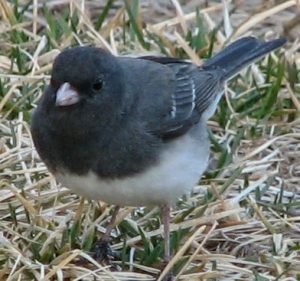 There are even more regional differences like the white-winged version of the slate-colored junco and the pink-sided version of the Oregon junco, which lives in the Rocky Mountains. 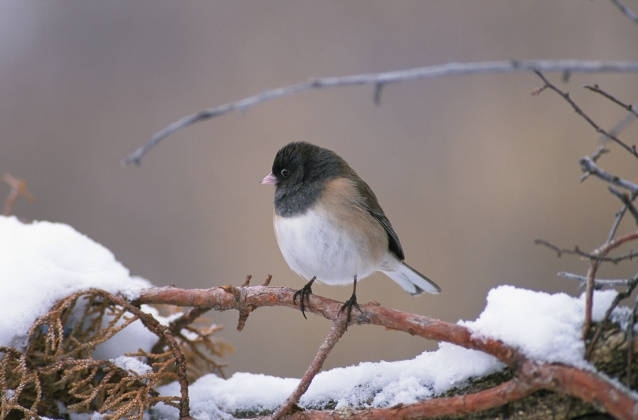 All dark-eyed juncos have black eyes, white base tail feathers and pink beaks. They like to be heard. Dark-eyed juncos have a high-pitch song, and males sing a trill that can be heard several hundred feet away. They also have quieter whistles, chirps and calls. Juncos have a pecking order. When we see dark-eyed juncos, they are often in a group, and they can form large flocks in their overwintering areas. You might even see several different subspecies in one flock. Within these flocks, juncos typically have a hierarchy, and earlier arrivals tend to rank higher. You can entice them to your feeders. Dark-eyed juncos are fun to watch, because they hop instead of walk as they forage, and they are common at backyard feeders in Iowa. They are primarily seed-eaters in the wild, searching out chickweed, buckwheat, lamb’s quarter and sorrel, and at bird feeders they seem to really like millet. Spread millet on the ground and you’ll have the whole gang “flock” to your yard.